In the fall of 1889, Evangelist W. P. Cline held a tent meeting in Bixby, Oklahoma. This marked the beginning of the current Downtown Bixby Church of Christ congregation. 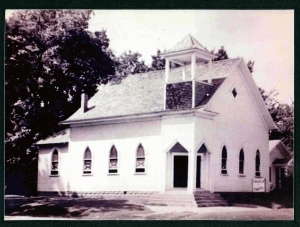 Over the years the congregation has been identified as the Bixby Church of Christ, Church of Christ and the first Church of Christ in Bixby before adopting the current name. On January 3, 1914, Mr. & Mrs. J. S. Wilkins sold the church its first property in downtown Bixby at the corner of Dawes and Cabaniss where a small white wooden frame building with a basement was constructed to become the permanent home of the Downtown Bixby congregation. The cost of this lot was $22.00. The original size of the congregation was 18 people and has since grown to approximately 260. Since its beginning, the congregation has purchased two parsonages, a city lot for a fellowship hall and an additional lot for parking space. The original building was torn down and a more modern and spacious brick building was constructed in 1962/63 which served as the congregational home until February 2007. That building was sold in 2007 and the congregation leased the empty United Methodist church building on Breckenridge Street as an interim worship site awaiting the construction of a new facility. In 2006 and 2009 the congregation purchased approximately 11 acres of farm land at 158th Street and South Memorial Drive from Conrad Farms to serve as a new building site. Construction began in 2008 and the new facility was occupied in March 2009.